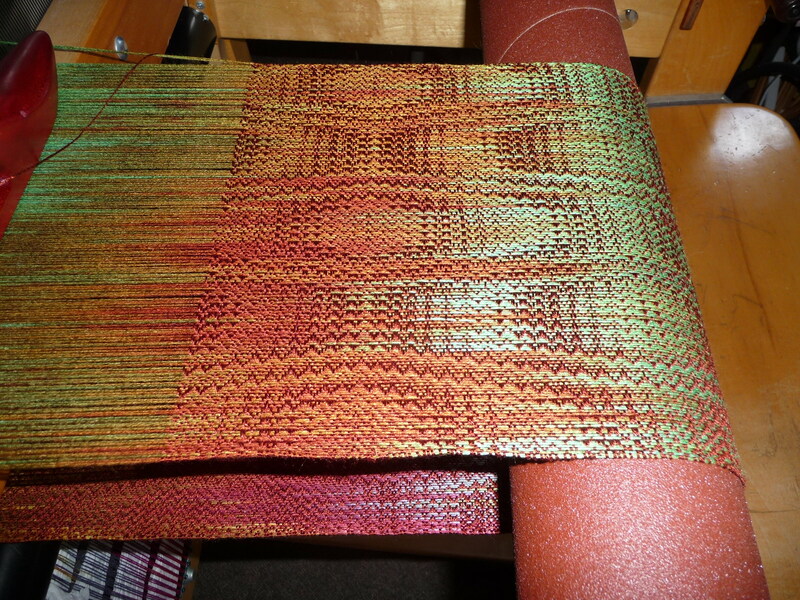 The hand-painted Joseph’s Coat warp I got from Blazing Shuttles in North Carolina has turned out to be both more interesting and more surprising than I’d expected. 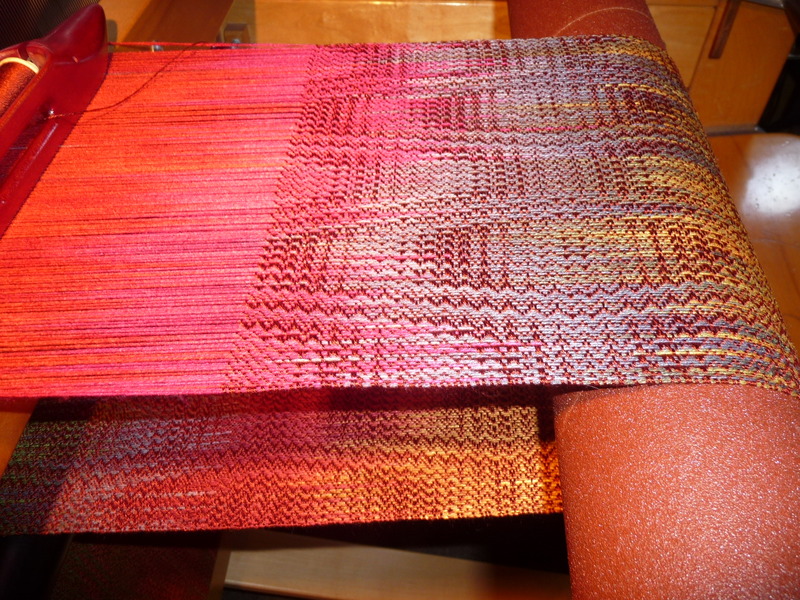 The appearance of new swathes of color as the warp moves to the front of the loom where the actual weaving is going on keeps me from getting bored (frequently a problem for me), and the ways the warp colors interact with the weft color is fascinating. Then the patterns I’ve designed add yet another element to the fascination. 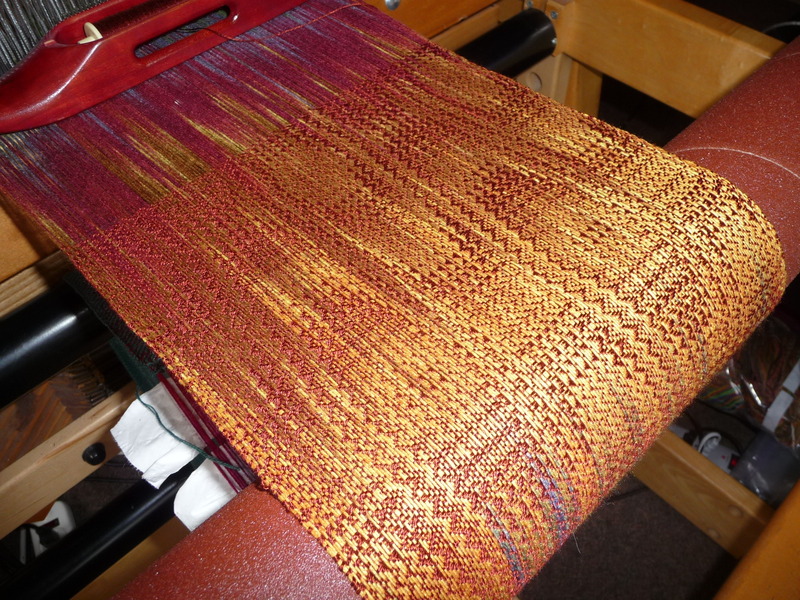 This weft yarn is a deep earthy red-brown tencel, which doesn’t match any color in the warp yet accents some and blends with others. Or merely makes a combination that’s so rich and warm that I grin with pleasure. And then another interaction that seems interesting ~ The red-brown on top of that green reminds me of red dirt country and the grasses at the sides of the road. I don’t often have an idea of “what this is about”, nor do I in this case, but certain colors and combinations sometimes bring up memories or images I’d forgotten. 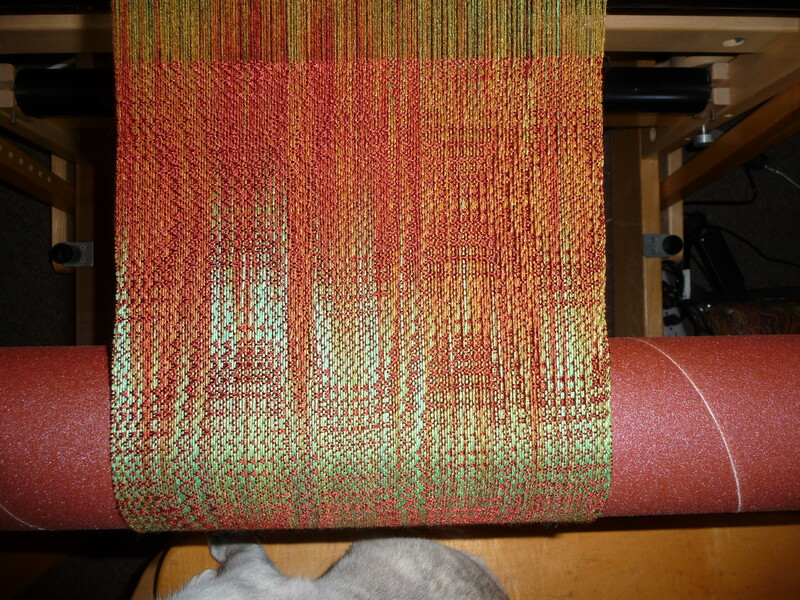 Tomorrow I finish weaving this one, and begin the fourth and final scarf of this series. 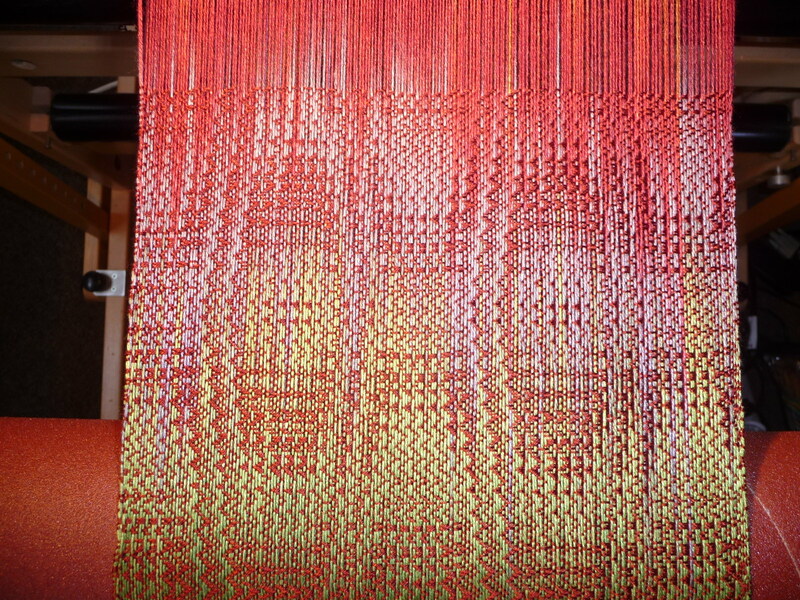 The warp for the next batch of work is ready to go onto the loom as soon as these scarves are finished. Should be by the weekend. 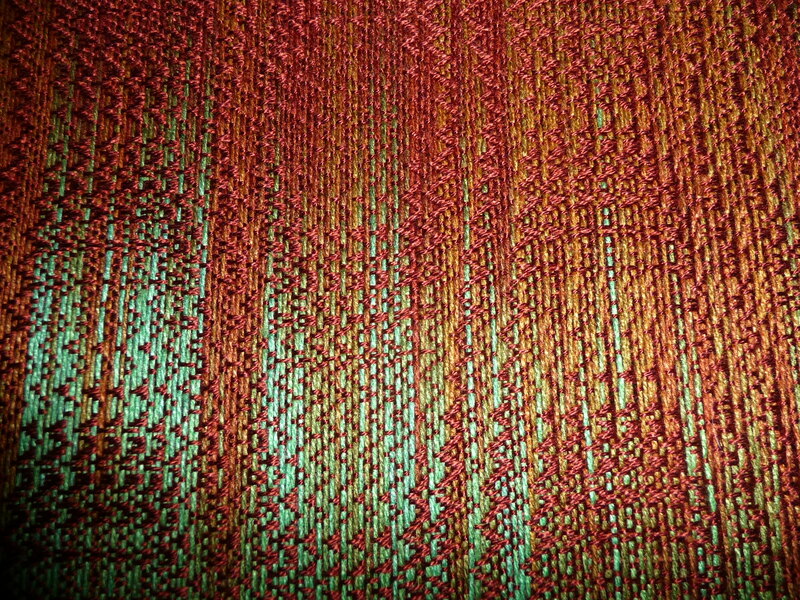 Here’s a teaser — the next warp will be purple and blue.